Alongside the enthusiast-oriented DMC-GX7, Panasonic has announced the Leica DG Nocticron 42.5mm F1.2 - the fastest autofocus lens ever created for the Micro Four Thirds system. If you're getting a sense of deja vu that's because Panasonic actually announced this lens already (sort of) at last year's Photokina tradeshow in Cologne, Germany. But what was then a dummy lens behind glass now appears to be a real product, albeit one without any firm availability date or pricing information. The Leica DG Nocticron 42.5mm F1.2 is optically stabilized, and covers an effective focal length of 85mm on Panasonic and Olympus Micro Four Thirds cameras, making it an attractive proposition for portraiture and low-light candid work. Details are scant, and we're expecting more information later this year. NEWARK, NJ (August 1, 2013) Panasonic today announced the LEICA DG NOCTICRON 42.5mm F1.2 lens, the fastest (1) interchangeable lens in the Micro Four Thirds standard for the LUMIX G Series cameras. 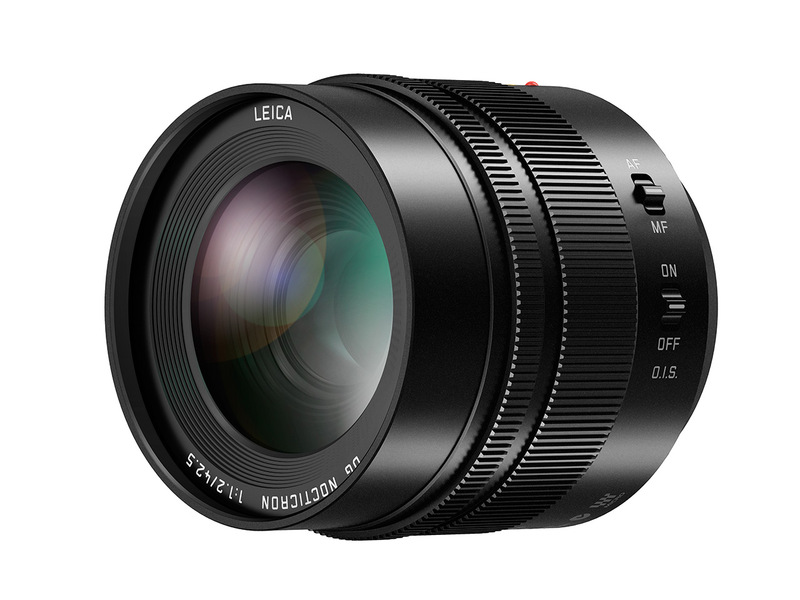 Previously, Panasonic has marketed interchangeable lenses meeting LEICA specifications, including the LEICA DG SUMMILUX 25mm/F1.4 ASPH. and the LEICA DG MACRO-ELMARIT 45mm/F2.8 ASPH./MEGA O.I.S. The name "NOCTICRON" was defined by Leica Camera AG for this lens type continuing LEICA's legendary elements of large diameter, high quality lenses. The LEICA DG NOCTICRON 42.5mm/F1.2 achieves the fastest (1) F1.2 for a Micro Four Thirds interchangeable lens, becoming the first large diameter, high performance NOCTICRON lens. Panasonic will continue to further advance its product development to meet the diverse needs of customers in the globally expanding Micro Four Thirds market. Note 1. For an AF interchangeable lens, as of August 1, 2013, according to research by Panasonic. Note 2. Details of the product specifications, the date of release and the price are yet to be announced. See the lenses road map on our website. I can live with that. Another point is focussing very fast lenses on FF handheld (easy on my OM-D). As I need to stop down a little on FF, things get comparable. That's why my FF gear stays at home most of the time. Looks like another nice lens from Panasonic. Personally I like and use Olympus lenses on a Olympus camera body, but Panasonic sure has some nice lenses too.This one looks particularly promising. I did a search for 'yabokkie' on this page and got 32 hits. Read some, it's fun. I think he prefers the larger and heavier Nikon equipment ha, ha. I hope Panasonic will price this lens reasonable, but I think it will be expensive. Talking about pricing, I see no reason why a lens for the micro 4/3 system should be cheaper then one for a larger format. Heck, it could even be more expensive. Lenses need to be wider with a larger aperture and the small high resolution sensor is very, very demanding. The smaller lens elements need to be designed and made with utmost precision. This is the point of micro four thirds . What the heck is "light gathering capability"? I am so confused by the formula someone come up with - "42.5/1.2 = 85/2.4 = 35.4mm". Is a 1.2 lens 1.2 regardless of their focal length? If two lenses can project the same amount of light to per square inch/cm of sensor, do they have the same "light gathering capability"? Please help me to make sense the "42.5/1.2 = 85/2.4". > If two lenses can project the same amount of light to per square inch/cm of sensor, do they have the same "light gathering capability"? same "light gathering capability" to that square cm of course. but what image we will find projected on that square cm? an eye from say a Nikon FX and a face from CX? we got the same light for an eye on FX as a face on CX? btw, 1 sqcm is 11.6% on FX and is 86.1% on CX. at a certain angle of view, there is a cone/pyramid of light entering into the lens aperture that will be ultimately projected on the image circle/sensor (whatever focal length or format). the light gathering capacity is then solely decided by the aperture size (area). whatever happens in the lens can only lose light. As photographers, we are mainly concerned about the maximum F-Stop, FOV ( field of view ), and DOF ( depth of field ) of the lenses we use. In photographic terms, EVERY lens that has a maximum F-Stop of f/1.2 provides us with the SAME EXPOSURE provided the other main camera settings ( ISO and shutter-speed ) are the same. In terms of EXPOSURE, all that matters is that the F-Stop of the lenses matches, the ISO of the camera matches, and the shutter speed of the camera matches. Things get a little more complicated when you want to match the DOF between two cameras that have different sensor sizes. For example, the DOF of a Canon 5D Mk3 camera using a 50mm lens at f/2.8 matches the DOF of a Panasonic GH3 camera using a 25mm lens at f/1.4. So matching the of the DOF of the 5D camera requires a lens that is 2 F-Stops faster with the GH3 camera. Thank you for the replies but I am still confused because you were talking about comparing with 5D or FX. Why are we comparing with 35mm not, say, a medium format which may give us another formula 42.5/1.2 = 175/4.8? If the formula is right, should I always compensate my exposure on my GX1 if I do manual exposure? Matching DOF is even more confusing to me, I can't think of a case that I need to match another camera's DOF when I am using a different one. Oh, does that mean "DOF of 42.5/1.2 on my GH3 == DOF of 85/2.4 on FF"? Then, what the heck is role of the "light gathering capacity" in this formula? >>> should I always compensate my exposure on my GX1 if I do manual exposure? No. Exposure is always the SAME. Same ISO, same F-Stop, same shutter speed. If you don't need to match DOF, then forget about it and just concentrate on achieving a good shot with the correct exposure. No photographer is concerned about "light gathering capacity", we are concerned about F-Stop, Shutter Speed, and ISO. Mr. Yabokkie seems to have absolute "light gathering capacity" and matching DOF on the brain. It's obviously a big concern to him, but may be of no concern to anybody else. For myself, my main concerns are capturing the moment with sharp focus and correct exposure. This is all that matters to me as a professional photographer. > what the heck is role of the "light gathering capacity" in this formula? what will anyone need whatever capacity in the first place? if you say image quality, then you get that capacity exactly the same at a certain AOV and aperture size regardless of formats. this "happens" to also give the same DOF as well as same diffraction and DLA. same amount of light to the frame, to each portion of the image, be it an eye or a pair of lips, nothing to do with sensor area. why should anyone need conversion to 35mm format term? ask Olympus or Panasonic who give equivalent focal length for all their lenses, from P&S to m4/3". all the makers use 35mm format term as standard for better communication. even a customer doesn't know well, at least he can use it to compare different product and decide which is best. for 42.5/1.2 we know it can perform same as 85/1.8 stopped down near 1 stop, that all the photographic effects, including image quality, will be the same. Thank you. You clarified the issue. I have a old Canon 300D (not a FF also not a 4/3 either) and 17-40, 70-200/4. After evaluating the price and weight/size of a 6D, I bought a GX1 and a 14/2.5 for the amount of hiking I plan to do. I found converting the actually focal length to a equivalent 35mm field of view helpful when buying a lens.However, when using a lens, I found the conversion is irrelevant. I got whatever the lens produce. Then, I saw this formula which list all 4/3 lenses like 20/1.7 = 40/3.4, 25/1.4 = 50/2.8, etc. Because I use mostly A mode, the formula seems indicating that the shutter speeds should have been doubled on GX1 comparing to (or thinking of) a FF camera. Then, the question rises. What if I am thinking of a medium format camera? which makes it funny. sorry to say you still don't understand the issue. that format size has nothong to do with light gathering. the light gathering capacity is decided by the aperture size regardless of the format size. because the aperture sizes of medium format lenses are actually smaller than 35mm full-frame, we won't get better low light image quality going medium format, very likely we will get worse. 80/2.8 = 50/1.7 = 28mm < 36mm of 50/1.4. the quality of lenses is the dominating factor in photography. senser performance is also an issue but more a temporary one. btw, if you want to go back, go back to 6D for better image and value for money. >>> Then, I saw this formula which list all 4/3 lenses like 20/1.7 = 40/3.4, 25/1.4 = 50/2.8, etc. This is a DOF formula, so it's only useful if you need to match the DOF of a Full Frame camera. Most of the time I shoot with Micro 4/3 and APS-C cameras, so I personally don't care about trying to match the DOF with Full Frame sensor cameras. In terms of EXPOSURE, if the F-Stop matches and the Shutter speed matches and the ISO matches, then you have EXACTLY the SAME EXPOSURE using ANY camera with ANY sensor size. As I posted earlier, too many people get caught up in trying to match the DOF between different camera formats, when most of the time it really doesn't matter at all. this is formula for all the photographic effects that you can find in the output image that are controlled by the lens aperture. there is only one aperture. what we want it is image quality. the exposure you are talking about is irrelevant if it gives different image quality on different formats. this maybe the reason some of us get fooled by themselves. Overall, the APERTURE of the lens is a VERY SMALL factor in the final IMAGE QUALITY of a photograph, compared to all these other critical components. keep your cool man and don't lose your mind. if as you say aperture size is unimportant then why should 42.5/1.2 be sold higher than 45/1.8 when there is nothing we know other than the spec. aperture size is the single most important factor that decides value of a lens whose job is gathering light and then projecting to the sensor. As photographers we use the F-Stop of a lens to determine the effective photographic APERTURE of a lens. Nobody cares about the physical size of the aperture of a lens, all we care about is the photographic APERTURE. Thus a f/1.2 lens is a f/1.2 lens, and can be compared to any other f/1.2 lens. This is the photographic speed of the lens, and the ONLY thing we are concerned about when talking about the APERTURE of a lens. Thus a Micro 4/3 f/1.2 lens has the SAME photographic APERTURE as a Full Frame f/1.2 lens. END OF STORY. let me answer you in a less confusing manor..
that formula you mentioned was to get the equivalents, in depth of field on a Full Frame camera with equivalent angel of view. In optics, the f-number (sometimes called focal ratio, f-ratio, f-stop, or relative aperture) of an optical system is the ratio of the lens's focal length to the diameter of the entrance pupil. It is a dimensionless number that is a quantitative measure of lens speed, and an important concept in photography. A 100 mm focal length f/4 lens has an entrance pupil diameter of 25 mm. A 200 mm focal length f/4 lens has an entrance pupil diameter of 50 mm. The 200 mm lens's entrance pupil has four times the area of the 100 mm lens's entrance pupil, and thus collects four times as much light from each object in the lens's field of view. But compared to the 100 mm lens, the 200 mm lens projects an image of each object twice as high and twice as wide, covering four times the area, and so both lenses produce the same illuminance at the focal plane when imaging a scene of a given luminance. Some people prefer to argue about things OTHER than making pictures. They will quote technically correct "facts' until the cows come home but rarely actually shoot a picture. We used to call them "gear-heads". Like obsessive hi fi buffs who rarely listened to an album all the way through. - and other even less flattering terms. Wanting suggestions for side by side comparisons on the EM1 and EM5. I'll be interested in this lens, but would want to do quite a bit of shooting with one before booting the Zuiko 45mm-f/1.8. It and the 75mm-f/1.8 perform very well, as does the new 12-40mm-f/2.8 zoom. The most important unknown at the moment is the IQ of the lens, although I'm sure the price is going to be too high for many. But it is what it is, i.e. a Leica design, f/1.2 lens. If the price is too high for, then go get the Oly 45 f/1.8. There is now a niche for both types of user, those who are happy with the Oly and its price, and those whose needs (or pockets) justify the Panny 42.5mm. There's also the Voigtlander 42.5mm f/0.95 to boot. There's no other lens system in the world that offers such a fantastic range in just this focal length - not even Leica has a Noctilux lens in this 85 to 90mm focal length. So, I'm just glad m4/3 is maturing nicely. Now, let's see what the price will be. will beat the hell of the this genuine Pana fake Leica 42.5/1.2. will beat the hell of the this Leica 42.5/1.2. The whole reason for buying a premium lens like this is for the absolute speed and image quality of the lens. Very likely this lens will reach near optimal performance at full aperture ( f/1.2 ), and with the benefit of the OIS system you can obtain sharp images at shutter speeds that are 2-3 F-Stops slower than shooting without the OIS system. A FF 85mm f/1.8 lens can definitely shoot a great image, but NOT at f/1.2, and NOT with OIS, so you will need MUCH MORE LIGHT to achieve correct exposure when compared with this new Panasonic 42.5mm f/1.2 OIS lens. this 42/1.2 is no premium lens. it'll get you no better result as an 85/2.4 on 35mm format. no worse result either, of course. same result. near 60% of 85/1.8 in terms of light gathering capacity. you are correct on IS, which is missing from D800/D600. though it may be more difficult to make good sensor shift ones for FX, I really hope Nikon and Canon follow Pana to do the right thing. then whats the point of buying any lens from m43 is the 42.1.2 wouldnt be a premium lens? maybe in terms of DOF it would be at 85mm 2.4 but its still 1.2 in terms of light gathering. nothing is even remotely close to this speed less it be a voigtlander which is all manual and metal. >>> this 42/1.2 is no premium lens. Only according to you, Yabokkie. This new lens is a high speed "portrait" telephoto lens with a built-in optical stabilization system. You have to STOP trying to equate a f/1.2 m4/3 lens with a f/1.8 FF lens, because they are NOT THE SAME. The m4/3 lens is 1.1 F-Stops FASTER, and likely reaches close to optimal sharpness WIDE OPEN like the other premium m4/3 lenses do. I expect this lens will be priced around $1,200 US, and should prove very popular amongst professionals ( like myself ) who don't mind spending this kind of money on a high performance lens. Especially at this focal length which is very useful for still-photos and video work. a "high speed" lens that gives you lower image quality. you can have whatever speed if you don't care image quality. If the lens has premium optics designed by Leica, combined with an effective optical stabilization system it should prove to be an outstanding quality lens. Many of the Olympus and Panasonic premium lenses are state of the art when it comes to camera lens optical design. Several lens testing companies have called the Olympus 75mm f/1.8 Micro 4/3 lens to be the BEST DSLR lens of ANY brand that they have tested over the past 10 years. It's an extremely good lens that is tac-sharp at full aperture, with very low levels of chromatic aberration, very low levels of distortion, very low levels of vignetting, and it's very fast when auto-focusing. It doesn't get better than this lens. I expect this new Panasonic lens will be another outstanding lens for Micro 4/3 cameras. yabokkie, If I imagine myself using a FF body + an 85 f1.8 in the contexts and ways I used the OMD + the 45mm f1.8, I can't stop laughing. Also, the "equivalence" works in both ways: 6x the volume (and weight) of camera and lens is worth that half stop of advantage of the 85 on FF? I agree that if weren't for volume and weight, the "equivalence" would have been a lot easier. I love my 25mm f/1.4 and I want this lens also, now give me this lens at a reasonable price. 42.5/1.2 at 280 US may be a reasonable price, too. which is nearly 1 stop less than 85/1.8 which is the choice anyone want high performance at a reasonable price. it'll worth less if using Canon 85/1.8 as a standard. this is a very good lens that we have been enjoying for more than 20 years. It is an equivilant of an 85/2.4 in DOF not exposure. exposure at the same ISO won't give you same image quality. so are you saying, same fast speed, two stops worse IQ? if you don't care image quality, you can have whatever fast speed at will. It all depends on the quality of the lens, the quality of the image sensor, and the quality of the image processing performed by the electronics of the camera. Physical sensor size may have no relevance if the technologies used in each camera are not the same. as long as we can have same aperture lenses for different sensors. 42.5/1.2 is about as fast as the Summarit line (f/2.5 equiv.) while 25/1.4 should be Elmarit (f/2.8 equiv.). hope there will never be a Hitlux or Nazicron. as far as I can tell from what I read: whereas the focal length can be doubled to have an equivalent to 35mm FF, the fstop remains the f-stop because it is the ratio between focla length and max opening of aperture. this does not translate the way you calculated. In optics, the f-number (sometimes called focal ratio, f-ratio, f-stop, or relative aperture) of an optical system is the ratio of the lens's focal length to the diameter of the entrance pupil. It is a dimensionless number that is a quantitative measure of lens speed, and an important concept in photography. focal length won't change either but same focal length won't get you the same angle of view on different formats. f-number is same. you have to use focal length to calculate f-number and you say f-number is immune from formats? there is nothing in the output photograph that you can find the same at the same f-number on different formats. at a certain angle of view, if the absolute aperture size (like diameter in mm) is the same, you get everyting the same on whatever formats. Buy a metabones speedbooster for NikonG to m4/3 and a Nikon 50mmf 1.8 and you end up with a 71mmf1.0. Obviously it will work with other NikonllG as well. But you will have to use a tripod as it will be all manual and no stabilization, if people have a FF system and a m4/3 or Nex system a speedbooster will give you lots to play with for not much money. why should mount a Nikkor on an inferior body? >>> why should mount a Nikkor on an inferior body? I shoot corporate video for a living. In the world of video production, the Panasonic GH2 and GH3 cameras produce BETTER quality video than pretty much any other brand of DSLR camera. The Canon 5D Mk3 and Nikon D5200/7100 are very close in quality, with RAW video from hacked Canon 5D Mk3 being better than the GH2/GH3 cameras. Blackmagic has a new $995 Pocket Cine camera that is just coming on the market right now, that might prove to be the best low cost digital camera for video. And it uses the SAME Micro 4/3 lenses as the Olympus and Panasonic cameras do. For still photography work, the Micro 4/3 cameras have proven that they can compete against the major DSLR brands ( Canon and Nikon ) when used at the SAME Mpx image settings. Lots of professionals ( like myself ) are using m4/3 cameras for paid photography and video work. Brace yourselves, the DOF equivalency posts are coming! just stop down a Canon or Nikon 85/1.8 by 2/3 or 1 stop and you will see it, as well as the light gathering capability. this lens can do the job of a 85/2.4 at best. In terms of light gathering capability, this will behave like a f/1.2 ..
DOF is one thing and it varies with sensor size here, aperture is another. Whether sensor size affects DOF or not depends on how you define CoC, circle of confusion. One definition of CoC is based upon resolution of the system, e.g. pixel size. The other definition is a based upon the length of the diagonal, e.g. 1/1600 of the diagonal. But - no matter which one you choose, its absolutely not 100% depending on aperture size. well, at the same angle of view which is a common pre-condition. Admittedly, they did announce this lens last year, but they didn't announce it was going to be a "PanaLeica" (made by Panny, designed by both, QC by Leica), or that it was going to be optically stabilised. This thing is going to be eye wateringly expensive! better Leica nothing, because Leica means looser. by a gang of Japanese near half a century ago. a line of small aperture lenses. OK, lets see how things compare in terms of APERTURE, where we are talking about CORRECT EXPOSURE and FOV, NOT DOF. So in terms of FOV and exposure, it looks to me that the Micro 4/3 format ( with the assist of 4/3 lenses ) is doing OK.
Just a question... don't you apply the crop factor to the aperture also, so a .95 would be 1.9 on FF? Otherwise, in terms of FOV ( field of view ) and exposure, a Full Frame 85mm f/1.2 lens equates to a Micro 4/3 42.5mm f/1.2 lens. When you want very thin DOF ( aka "paper thin" DOF ), it is much easier to achieve this with a Full Frame system, as your Micro 4/3 lens has to be 2 F-Stops faster to match the FF DOF. When you want proper FOV and exposure, then all that matters is the actual F-Stop of the lens and that the FOV is equivalent. This gives an advantage to the m4/3 system, as the lenses are smaller and sometimes cheaper than the equivalent FF lens. In terms of maximum detail, the Full Frame cameras have a big advantage. There is no m4/3 equivalent to the Nikon D800 36 Mpx sensor, so FF systems are the only choice here. If technology progresses ( it always does ), eventually you will be able to buy a 36 Mpx Micro 4/3 camera while FF cameras will be 70+ Mpx or better. there is only one aperture that controls everything an aperture can control (namely 1: light gethering capability, 2: DOF, and 3: diffraction). not a tiny bit can anything step out of line, regardless of the sensor format. Pana 42.5/1.2 is equiv. to 85/2.4 on 35mm format (42.5/1.2 = 85/2.4 = 35.4mm aperture size). there is no way it can do more (as the spec suggests). since 42.5/1.2 = 85/2.4 has less than 60% of light gathering capability of 85/1.8, it worths less than 60% of 85/1.8 or less than 300 US if the resolution, aberration, ... are similar. at a certain angle of view and regardless of sensor format, if you get same DOF, you are guaranteed to get same light gethering capability and diffraction, whatever controlled by the aperture. would appreciate you calculating the aperture size before posting. the infamously ill-designed ZD35-100/2.0 got a maximum aperture size of 50mm at tele-end which is the same as 70-200/4. ONLY in terms of DOF. In terms of FOV, they are the SAME. In terms of EXPOSURE the FF 85mm f/2.4 lens is 2 F-STOPS darker, and CANNOT be used with the SAME settings to achieve CORRECT EXPOSURE. As mentioned previously, you DON'T shoot a head-shot with a FF camera using an 85mm at f/1.2, because all you have is paper-thin DOF. The eyes will be in focus, but nothing else will be, resulting is a sh*tty shot. ...I started shooting professionally in the 80's using Nikon and Olympus 35mm film cameras ( equivalent to todays FF digital cameras ), along with a Mamiya RZ67 6x7cm roll film camera, Sinar 4x5 and 8x10 large format sheet film cameras, Speedotron Black-line 1200, 2400, 4800 watt-second flash packs. So I'm pretty familiar with how camera gear works, though I mostly shoot video these days. Shallow DOF is a LOT less important than you may think it is. You seem to be stuck in DOF land, when what mostly matters in photography is FOV and EXPOSURE. The maximum photographic APERTURE of the Olympus 4/3 35-100mm f/2.0 zoom lens is f/2.0. To match the exposure with ANY other camera at the SAME settings requires an F-Stop of f/2.0. An F-Stop of f/4.0 on a FF camera is 2 F-Stops darker than f/2.0 and will result in UNDER EXPOSURE if all the other photographic settings are the SAME. @yabokkie, just so I'm clear-- if you were setting up a 1/350 sec shot at f1.2 on a FF camera at iso 100, you're saying on a m4/3 camera at iso 100 I should be shooting 1/350 sec at f2.4? And on a medium format camera shooting iso 100 slide film, it would be 1/350 sec at f 0.95 or less? f1.2 is f1.2 is f1.2. It's a ratio. And everybody talking about multipliers confuses newer photos about how exposure works. same ISO will give you different image quality on different sensor formats. exposure 1/350s at f/0.95 on 4/3" gives you the same image, same image quality, as 1/350s at f/1.9 on 35mm format, because both got the same amount of light to the frame. after all, image quality is what we want, not some settings on the camera. > f1.2 is f1.2 is f1.2. It's a ratio. whatever it is, no one can find a single thing in the output photograph from different formats that is same at the same f-number. so it cannot be carried accross formats. just like focal length. you don't have to worry for others. multipliers are simple straightforward calculation with sound base in physics. we know it for ages only we didn't use it so extensively as now with digital cameras. > after all, image quality is what we want, not some settings on the camera. yabokkie, if you believe that then why do you constantly bang on that lens prices should be based solely on the physical aperture size and completely ignore important IQ measures such as sharpness, contrast, CA, distortion etc? Not to mention the fact that FF lenses only have more light gathering capabilities when you pair them with more expensive FF cameras, an 85mm f2.4 lens has half the light gathering capabilities of this 42mm f1.2 lens when they're both used on an m4/3 body. well I'm only saying most of 4/3" lenses worths far less than their street price. I have no problem if Panasonic say they want to sell lenses at much higher prices because their cameras are cheap. I don't think they are. Looks like a great lens and a fine addition to what is shaping up to be a very serious system in the world of photography. Now, if only we could get a moratorium on those fruitless discussions of FF vs m43 by "serious DOFFERS". Great lens! Funny to see such stupid comment about m43 and FF. Both systems are great ! All Leica did was help design and quality control the lens. They do a bit more than collect a fee, as ignorant people seem to think. I don't think Pana tell Leica how they design and make lenses or Leica will be able to make themselves. Too many people are trying to equate Micro 4/3 and FF DOF, which is largely missing the point. Equivalent FOV is what it's all about. Same F-stop, same exposure. Micro 4/3 lenses have a 2 stop disadvantage when it comes to shallow DOF, but most Full Frame shooters aren't shooting EVERY shot wide open because often the DOF is TOO shallow. i.e. A head-shot where the subject's eyes are in focus but their nose is out of focus is NOT a flattering shot. I shoot corporate video for a living with Panasonic Micro 4/3 cameras, and most of the time my aperture is between f/2.0 and f/4.0 in order to get usable DOF in my shots. With a FF system I would be shooting at f/4.0 to f/8.0 to get the same DOF. Unless you have a burning need to shoot EVERY shot at full aperture with your FF camera, the Micro 4/3 DOF difference is generally not an issue. Now Micro 4/3 shooters have a very fast 85mm FF FOV equivalent with built-in optical stabilization, something none of the FF camera systems have. You are right, for a portait in FF, f/4.0 and 85mm was what I used very often. Reguarding fixed focal lenses, MFT has no problem with lenses like the Oly 1.8/45mm. But with zoom lenses, it is a total different story. There are a lot professional f/2.8 FF zoom-lenses and semi-pro f/4.0. But the best MFT has to offer right know are just two expensive f/2.8 lenses, that have the same DOF as simple f/5.6 FF-kit-lenses. I agree, I like shallow dof portraits, but if it is too shallow, the head looks massive. When we see someone's face with our eyes, everything is in focus. Only on really large objects or something close to our face we see parts out of focus. > Equivalent FOV is what it's all about. Same F-stop, same exposure. Misleading. On FT 42.5mm/1.2 on ISO 200 gives same FOV, same DOF and same number of photons per image&time as 85mm/2.4 on ISO 800 on "FF". *That* "is what it's all about". I would not call that "very fast", I'm rather sure I'll call it "very expensive", though. > I would not call that "very fast", I'm rather sure I'll call it "very expensive", though. What equivalent lens is faster? We are talking about lenses that have an FOV or Angle of View of 28 degrees, that provides correct exposure at f/1.2, and also incorporates an optical stabilizer ? The closest lens that I can think of is the Canon 85mm f/1.2 L lens that costs roughly $2,000 and does not have built-in OIS. If I'm trying to shoot a portrait of a jazz musician in a dimly lit smoky bar, then I might choose this 42.5mm lens set to f/1.2, set my camera ISO to 3200, and use the OIS to be able to achieve a sharp image at 1/15th or 1/8th of a second. If I was shooting with a FF camera, I might choose the Canon 85mm set to f/1.2, but without the OIS I may have to shoot at 1/125th or 1/60th second at 12,800+ ISO to get a sharp well exposed image. > But the best MFT has to offer right know are just two expensive f/2.8 lenses, that have the same DOF as simple f/5.6 FF-kit-lenses. Yes, in terms of DOF m4/3 lenses are expensive and can't match FF zooms for shallow DOF. With any luck Olympus will port the 4/3 f/2.0 zoom lenses over to the m4/3 format, which will be hugely expensive $2K+ but they are some of the sharpest zoom lens ever made. Pretty much tac-sharp at full aperture, which not many FF zooms can match. I am also hoping that at some point Sigma will port their new fast f/1.8 and f/2.0 DX zooms to the m4/3 format. Olympus is about to announce their first professional m4/3 camera body, so I'm hoping that they might announce some new lenses to go with this pro body. What a nice addition to the M4/3 lens catalog! It just keeps getting better and better. Odds are this will be a pretty expensive lens ($1000+? ), but at least you now have a very nice portrait lens if you need the extra speed. While I would love to own this lens, my budget says "45mm f/1.8" instead. I'm going to guess $1300 or thereabouts. The Panaleica 45/2.8 macro is now $719 discounted from $900 (I only checked B&H), and I expect the additional stop+ to be very dear. My budget is going to steer me toward the Oly as well, and that's fine by me. since this lens has 0.83 stops less light gathering capability than 85/1.8 ones at 420-500 US, it worths 0.83 stops less or around 240-280 US. it worths even less in Leica brand which means no genuine glass. sorry it's 0.77 stops difference, worths about 270 US. > sorry it's 0.77 stops difference, worths about 270 US. But then if need to add the extra cost of a full frame camera, and the difference in sharpness between your $270 85mm lens and this one. yes resolution is another weak point of 4/3"
@goshigoo: "Also, IQ wise, 6D + 85 f/1.8 @ f/2.4 could be better than this lens. 35mm FF still has it's value when shallow Dof is needed"
No. A Leica full frame camera is king, yes, but by no means good value. Canon and Nikon FF cameras are for dorks. What's the point of all this shallow DoF when your ridiculous camera gets in the way all the time. A full frame DSLR is to photography as a cargo truck is to driving cars. A cargo truck is what professional truck drivers use to get a load from A to B, sure, but in my spare time I'd much rather enjoy driving a fine German or Italian automobile. And in this realm, a Leica M9 or Sony RX1 really wins. But the system Panasonic and Olympus have built up is a very fair alternative, with great lenses. goshigoo is right, and you are completely wrong. all German kings were killed by Japanese peasants half a century ago. I would happily mate this with the new GX-7. I had a GH1 and loved the IQ. I gave it up for Sony SLT-33 because I needed faster focusing but I am now looking for a replacement system and this could be it. I need fast focusing indoors with available light. Small cameras capable of quality images need only apply;-). Check Voightlander's (Cosina) pricing for a similar lens that should give you an idea. With the "Leica" brand it will probably be more than a bit more. The 25mm 1.4 is $600. This should at least be double. considering that nikkor 32/1.2 is $900 and this is Leica + OS, $1200 sounds even optimistic. this one is 85/2.4, near one stop larger aperture. should worth twice as much. That would be my guess, too. I'd say CX 32/1.2 worths less than 160 US. As one who does a lot of night time street photography, I've been aching for this lens ever since they announced it a while back. The DOF isn't what made it so appealing (actually I don't mid a bit of DOF), the light transmission was. I'm just hoping that they keep it well under $1K. for less than 500 US. Yabokkie NOBODY cares about the physical size of the aperture of a lens. All we care about is the PHOTOGRAPHIC APERTURE of a lens. So a photographic /1.2 lens is a f/1.2 lens. END OF STORY. What we really need is an ignore option in the comments section. Jabermonkey, yabokie or whatever, is making it nearly impossible to read any comment section that has anything to do with lenses that are not FF. That's not your call. And name-calling is inappropriate. Yabokie may be an irritant and sound annoying but he is far from clueless. He has a few valid points. 135 is THE FORMAT for DOF, not medium format, not large format. There is simply no equivalent of 85mm F1.2 nor 50mm F0.95 nor 200mm F1.8 in any other format. I shoot with a Mamiya 645 and 80mm F1.9, the largest aperture in MF, but still no match for FF. you are basically right but 80/1.9 is about 49/1.16 by calculation so not too bad. I never used 80/1.9 but I didn't care much DOF on 120 cameras as on 135 ones. people chose 120 not for large aperture lenses but better image quality at ISO50. Damn at F1.2 with stabilization on, that must make some awesome low-noise night portraits possible, that is if the subject can hold still that long. "That long"? At this FL on m43, stabilization is VERY MUCH needed even at 1/80s, and if you want pixel sharp picture (not just 1000 lines for which the rule of thumb was made, but the whole 3000-4000 a sensor provides), you'll need it at 1/320s. Not long at all. That is why making ANY handheld cameras without IBIS in 2013, with sensors this dense, is just useless. Had Panasonic come out with this before the excellent and sharp-wide-open 45mm f/1.8, this would probably have sold a bit. Now more people will wait and see the test results before buying as this lens simply has to perform really well below 1.8 to be worth buying. Unlike sentiments expressed in numerous other comments, I do like the name Nocticron. Summicron, Summilux and Noctilux probably all had some people doubting the naming choice when those came out. Nocticron = late night clock. Roughly. I have the 45mm f1.8, I'm satisfied, but it's nice to have choices. I'm glad someone finally makes a m43 lens that fast with AF. I'm hoping for more. Knowing Panasonic, this lens won't be cheap. It should better be many times better than the excellent but cheap Oly 45mm f1.8 lens. Looking at the photo of the lens, it does not seem to have a manual focus scale to aid manual focus (if any). Manual focus would most likely be "fly by wire" again. This would not matter to amateurs but for experience photographers / videographers this is not a benefit. Lets see how this lens will cost and perform. Will the brighter aperture of f1.2 instead of f/1.8 make much difference to final image quality? about twice the value as Oly (adjusted by shorter FL). btw, 45/1.8 is sold for about 240 US in Tokyo. CV is going to make (or at least they try) 42.5/0.95 .. price not different tho. But its faster (85/1.9 equiv). Or you can try SpeedBooster and C/Y 50/1.4 (should be close to bit odd 70/2 lens). 42.5/0.6 to compete with Canon. a real challenge to micro-lens design/manufacturing. That may be true, but if you need that shallow depth of field you need to buy a full frame, that is just how it is. The Canon or Nikon cannot compete in size, so there are still advantages to the m4/3 system. It really comes down to where they price this lens. I think it will fit most users demands for a ~28° FOV portrait lens. viking79 wrote: "The Canon or Nikon cannot compete in size, so there are still advantages to the m4/3 system." That's assuming that small size is something you want. For many people with average to large sized hands, many of the m43 bodies have somewhat cramped controls, with shallow grips and not great ergonomics vs prosumer APS-C and FF DSLRs. One thing that Panasonic seems to have gotten right about the new GX7 is the fairly deep grip. But again, a portrait photographer working primarily in a studio or on location wouldn't necessarily make a small size body a priority. Flash system, grip, VF, ergonomics, and DOF control are all going to rate more highly than portability for many. Re: the CV lenses, it's nice to see the excellent CV 25 f/0.95 dropping in price as I've seen it for ~ $800 new from some of the Hong Kong Ebay sellers. Hm, I dont think m4/3s are competing against FFs. Not more than FFs are competing against MF. Simply different things for different stuff. And not sure how you, but Im not shooting portraits wide-open even on APS-C. To have subject reasonably in DOF, you usually need bit more DOF than f1.4 - f1.8 aperture allows. With for example 75/1.8 from Olympus you can shoot wide-open no prob (tho f2 is better sometimes). But if you use something like 85/1.4 on FF (FX) it usually isnt that useful, unless you like very limited DOF in portraits. "But if you use something like 85/1.4 on FF (FX) it usually isnt that useful, unless you like very limited DOF in portraits." Yep, focus on eyes, nose and ears and parts of hairs are completely OOF. Who would think that it is somehow good? And of course all those contextless passport photos are completely boring and useless to begin with. @marike6: "That's assuming that small size is something you want." Well, if you are not interested in Micro 4/3, then what is your interest here? So tiresome to see all this trolling from insecure people interested just to get the world to agree THEY have the "right system" - and others must either just plain wrong, or maybe even just plain stipid? Geez! will this Leica perform better than my 85/1.8 stopped down to f/2.2? Most likely it will perform good, Leica designed lens usually do. Apart from idiotic name its going to be most likely good. How can you expect anyone to know that? So someone already said it sounds like an Evil Robot Space-Baddie? Hey it's got a proper OIS switch! Nocticron.. sounds like one of the Decepticons from Transformers..
yes.. yes.. I know.. hush..! Shame it's over 40mm , I can count on two hands how many times I have used mr 45/1.8 in the last few years. . Now 15 - 25mm would be very nice indeed.. So use the 25mm PanaLeica f1.4? There is absolutely no shortage of fast glass in that range. "Panasonic actually announced this lens already (sort of) at last year's Photokina tradeshow in Cologne, Germany. But what was then a dummy lens behind glass now appears to be a real product, albeit one without any firm availability date or pricing information." Let us then wait for a few more updates, press announcements, and publicity flyers from them. Hey, we've got the time, right? One day, we might even know if the thing will in fact exist at some point in the future. That is a Very nice lens. I bet its price will be Very High as well. This looks expensive, at least 1000€ AF and OIS - waow! To be frank, on Full Frame you usually stop those lenses down to f/2.8 anyway to get decent quality and so something in the frame is actually in focus :) Sure, there are some cases where you actually want to shoot an 85mm f/1.4 at f/1.4, and for those cases you should buy a full frame camera. Oh god, more know-it-alls with their equivalency calculators I see... Good stuff! There's nothing wrong with a little format reality check. @BJN "OMG, this is only equivalent to a 360mm f/10 on my Linhof Technika! My Nikkor-T*ED 360mm f/8 that I got for $900 has a much shallower depth of field!" Umm. Yeah. That was useful. There is no "reality check" that is useful in this situation. This lens is a 42.5mm f/1.2 - nothing more, nothing less. I think you meant to say "there is nothing wrong with being a little obsessed with 35mm full-frame". If they cannot release it this year maybe it will be announced again next year. LOL. Nice, f/1.2 to f/1.4 seems to me to be a sweet spot for m4/3, still get nice shallow depth of field especially with a 42.5mm lens (about 28° diagonal FOV). F/1.8 seems great on APS-C. Rarely a need to go larger aperture than that, and if you need to there are always full frame cameras. Except that stellar f/1.8 lenses for APS-C and FF are quite affordable. I got a nosebleed just imagining the asking price of this lens. @BJN Might want to get that checked out, mate. Frequent lens-price-induced nosebleeds can sure affect a healthy lifestyle. "The LEICA DG NOCTICRON 42.5mm/F1.2 achieves the fastest (1) F1.2 for a Micro Four Thirds interchangeable lens"
DPreview should point out marketing lies when they paste them. I won't believe Leica has never heard of the f0.95 Noktor hyperprime, which came out ages ago. I won't say the Noktor has better IQ, but clearly Leica's above statement is BS. The footnote did specify AF lens. That line immediately hit my buttons too - I thought Voightlander might be disappointed to hear it- so I checked the footnote. Still I wish that they'd just state that in the body of the release, not as a footnote. While I agree with your sentiments, Dark Goob, one with a name like yours is in no position to throw stones. . . This lens sounds quite promising but "Nocticron" ? That is name is...marketing $!/"@%* lol. I'm not criticizing the lens...but just the name employed. They've done this before, though. For lenses between the Summicron and the Elmarit, the f/2.5 lenses, they are Summarit. It's just Leica's thing. Since 'summi' is already used for Summilux, summicron and summarit, and 'lux' is in both Noctilux and Summilux, they did what makes sense: Nocti indicates faster than f/1.4, and the cron indicates that it isn't f/1. Now, they've used f/1.2 as Noctilux before, but that was before they came out with the f/1 and f/0.95 Noctilux, which is what most people think of when they think Noctilux...so I don't begrudge them the new name. I like the name, it is catchy. Sure, it sounds more like a giant killer robot, but it is preferable to Touit. There's more to lenses (including Leicas) than F stops. My Summilux F1.4 75mm was sharper than my Noctilux F1.0, though the Noctilux had better colour. My 90mm F4.0 was not particularly sharp, and far more importantly for me: It lacked good colour. I know the first Noctilux was a F1.2 that is why I wrote "current Noctilux" are F0.95. I'm not talking about F stop or lens quality here, but about the meaning behind the denomination of this lens which is, as Leica do, based on its F Stop. I've read somewhere that Leica, when they cooperate with Panasonic, don't design these lenses and don't build them. They just "validate" the optical design and share their Name. That is why the fact Panny is mixing "Noctilux and Summicron" to define this lens is a bit hilarious to me. Despite it may make sense to some, that is pure Leica-Like Marketing. Again...I am not criticizing this lens. But its name. Well if the in-between of a Noctilux and a Summicron becomes a Summilux why is it so ridiculous to have a Nocticron? Right these Panasonic Leicas are made in Japan, not by Leica. I'm not sure it's publicly known which party designs the lenses. However they have a reputation as optically excellent. So clearly Leica (like Zeiss for some Japanese made Zeisses) is inputing some of its special optical knowledge into the mix. Why not use Nocticron? The name suggests the Noctilux, and this new Panasonic Leica is as fast as the first Noctilux. My point was that I'm not sure the naming is entirely based on the maximum F stop of the lens. The name may be marketing, but there's a reason people are excited about well done Leica-Panasonic lenses. They have it, while even the best Nikons and Canons struggle with color. I wonder how much better this is compared to the 45 1.8.. It's a lot better at wider apertures than 1.8. It's also unlikely to be noticeably better from 1.8 onwards, with the Olympus being so good already, perhaps on the border of possibility. Let's hope this new lens is on par with the Pana 25/1.4 or Oly 75/1.8 in terms of IQ. I don't think it makes much sense to compare this lens with FF systems. M4/3 is for people who want excellent image quality and a light weight system. If you want shallow DOF then get a FF and don't complain. I got both and both systems have their pros and cons. I can see a number of applications (professional) where I would use this lens on my GH3 or EM5. DPR should stop using the term "effective focal length". It is misleading. It is better to say "has FOV of". They should start referring to APS-C and FF lenses in terms of their "effective focal length" on m43. Seeing continuation of collaboration between Leica and Panasonic in lens-development for Micro Four Thirds System is a wonderful news! This would be my choice for portraits and low-light shooting, particularly in combination with Build-in O.I.S. Full frame is undoubtedly the way to go if shallow DoF is a very big priority. However, given the precedence of high quality primes on M4/3, I'm rather confident this lens will beat any 85mm f1.8 prime in overall IQ, even if stopped down to f2.4 or a bit further. Of course, portraiture tends to be one area where technical IQ points don't matter than much. IQ wise, a 6D with an 85mm f1.8@f/2.4 will almost certainly not significantly outperform a current M4/3 sensor with this lens at F1.2. Once you stop down two stops, FF begins to lose to the more efficient small sensors, and Canon's FF cameras already lag behind newer M4/3 sensors in dynamic range. Still, want the potential for shallower DoF? It's certainly smarter to go full frame, especially when you start comparing prices. While it's certainly true that FF has more flexibility when it comes to DOF control, it's less of an issue at these relatively longer focal lengths. Where M43 is most constraining is when trying to shoot wide angle shots of large subjects while trying to blur out the background. That's not really the task that this lens is aimed at. Yes, I'm sure you can concoct some specific counter-examples, but I suspect that they'd be much more the exception than the rule for the people who'd buy this lens. You just had to, didnt you. It's not the lens it's fault but the m43 system for having a tiny sensor. With DOF control you can create great atmosphere in pics. Serious DOFFERS need full frame. On the IQ question. Of course full frame delivers better IQ than m43. Better ISO and better sharpness. For really serious DOFFERS full frame is just a toy camera. Really serious DOFFERS use medium format. sure and really really serious DOFFERS use large format. So you do get the point. Nice. Now stop whining. However, I rather enjoy having room in my shoulder bag for stuff other than just camera gear. For those wanting to compare this lens to a full frame 85/1.8, if you head over to DXO Mark you'll find the Nikon 85/1.8 tied for first overall with the 85/1.4, both slightly edging out the $6000 200/2. I had to look for a while but I eventually found the Olympus 75/1.8. If that lens is any indication, this new 42.5/1.2 doesn't stand a chance. @joejack951: what you're seeing is not necessarily the lens. DxOMark will tell you that you can't compare lenses by ratings on different camera bodies. For example, that same 85/1.4 drops to a 28 (from 40 on the D600/D800) when you select tested on D700, 25 on D7000 and 22 on a D5000. The Oly 75/1.8 is 23 on a GH2, but 27 on am E-M5. The sensor plays a role in the equation. The lens itself may be just as good. I'm pretty sure that the 75/1.8 on the E-M5 being about as good as the 85/1.8 on a D700 is sufficient for even professional portrait work. Please cite your source regarding image quality of this lens. I am very happy with the DOF of my M43 system. I have FF and DX Nikon cameras and they are great, but they are also huge compared to my GX1. As far as DOF with a 1.2 lens, here is an example of my GX1 with a Minolta 50mm 1.2 MD. Pretty shallow DOF if you ask me. f/1.2 would be awesome, but I wonder how much better it will be than the already superb 45 f/1.8 from Oly, given it will be probably 4x as expensive? Was any prices announced yet? good addition to m4/3 series. 1) Leica designation practically guarantees this lens will be ludicrously expensive, as if the f/1.2 aperture didn't suggest that enough. 2) AF/MF switch on a M4/3 lens AND an aperture ring. For the love of all that is good, FINALLY. If the IQ of this is good enough, which it almost undoubtedly will be, I'll be very happy I held off on the 75mm f1.8 for this lens. If the aperture ring is mechanical/electronic like Nikon's AFD aperture rings, great. If not, I don't see the reason for it other than looks. Of course, Fuji's lenses have fully electronic aperture rings for some reason or other- probably to complete the look of their cameras. 42,5 and 75 are very different focal lengths. I'd think they would complement each other well rather than compete with one another. 1,2 is certainly fast enough even on M43. Well, personally I don't care too much about the aperture ring myself, as the OM-D has two dials, but if I were using my secondary body (a G3), I'd be very glad to have direct aperture controls so I can save the other dial for exposure comp or shutter speed. The AF/MF switch is more useful to me as it simply saves me a button. As for the 42.5 and 75mm focal lengths, I agree and disagree with you. In a general sense, yes they are very different focal lengths. However, for my personal uses, both would generally applied to portraiture. As such, for me having a 42.5 is much more important than having a 75mm as it's more versatile overall. My main reason for going with the 75mm would be greater subject isolation, but this lens should match it or be better in some scenarios. It's virtually impossible this lens will surpass the 75mm's sharpness though, but again that's not a priority to me. In any case, it looks to be a great addition to the system. I might get this because of the aperture ring. It's a definite ergonomic advantage of the Fuji x cameras over other brands and panny seems to have realised that. "I'll be very happy I held off on the 75mm f1.8 for this lens." Very different FLs, very different perspectives/distances when shooting the same object. Hard to replace one with another unless your object is small and just 2m away. And for the boring and useless head portraits (aka passport photos some love so much), even 45/1.8 is more than enough shallow, blurring even tips of ears a little when focused on eyes.